GIVE IT TO: ANYONE; this series is amazing! SUMMARY: After returning home from India, heartbroken Kelsey enrolls in college in Oregon and tries to move on with her life. She begins dating, but her two tiger princes soon resurface in her life. When Ren gets kidnapped, Kelsey must join his bad-boy brother Kishan on a dangerous mission through the Himalayan Mountains in an effort to locate a second magical artifact and save Ren from Lokesh. WHAT I LIKED: First of all, let me just say that I honestly do not feel these Tiger books get the attention they deserve. These books are absolutely INCREDIBLE, yet I know of no one outside the Goodreads and book blogging communities who has read them. They are getting huge review ratings everywhere I've looked, but no one I know personally is talking about them. Not one of my librarian friends or coworkers has read them, despite my talking them up like mad. How can this possibly be? I just don't get how this series is not everywhere by now. Do we always have to wait for a movie before we see decent press for such an amazing book series? If you still haven't read this series, what on earth are you waiting for? Once again, Colleen Houck held me entranced. Just when I was perfectly content with Ren and could not imagine liking any other love-interest for Kelsey, I got to know Kishan. Now I don't know which one to root for or where Houck will take the story next. I love the Indian mythology and magical lands and strange creatures Kelsey and Kishan encounter. The characters are endearing and readers will care what happens to them. As with Tiger's Curse, the ending of Tiger's Quest is a heart-wrenching cliffhanger. I don't know how I will wait until NOVEMBER for the release of Tiger's Voyage. WOW. WHAT I DIDN'T LIKE: As with Tiger's Curse, my only complaint is the overlong set-up for the quest; the adventure took way too long to begin. Ren does not get kidnapped until about 150 pages in, and the storyline of Ren, Kelsey, and her three hapless suitors really gets old quickly. It's so obvious Kelsey is going to end up with Ren instead of Jason or Li--how could she not? None of the three suitors can hold a candle to Ren or Kelsey's love for him. And once Kelsey makes her choice, the lovey-dovey stuff goes on and on and on. I am a huge fan of romance, but the endless smooching and hand-holding and hair-stroking was too much even for me. By the time Ren was taken, I was just really ready for the quest to begin. Once the quest finally begins, the story moves much more quickly. 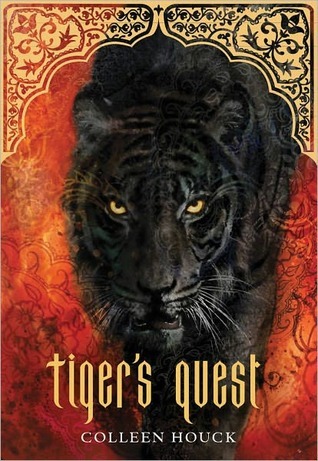 While this quest is not as heart-pounding as the one in Tiger's Curse, I really enjoyed getting to know Kishan better and have absolutely no clue who Kelsey will end up with. I am anticipating Tiger's Voyage with the same gusto I had for the later Harry Potter books, Breaking Dawn, and Mockingjay. If there are midnight-release parties for Tiger's Voyage, I'll likely be there. STATUS IN MY LIBRARY: We don't have Tiger's Quest just yet, but it's on its way! I have over 20 holds for our only copy of Tiger's Curse, and we have 5 more copies of that one coming also. If I had a hundred copies of these books, I'm convinced they would all be checked out. I temporarily stopped booktalking Tiger's Curse until our additional copies arrive.